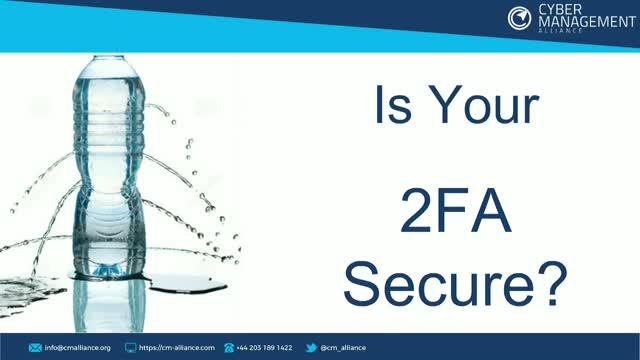 Most 2FA Solutions are Insecure, Is Yours One of them? Everyone knows two-factor authentication right? or do you just know how to use it? Something you know and something you own is a phrase we can all recite but very few actually understand two-factor authentication and its true benefits. How it works, why two solutions are not alike or what to look for in a true secure solution are just some of the conversation topics covered in this webinar. Wow - This is an exciting and busy webinar - with loads of templates and downloads too! * Live session on how we create an incident playbook from scratch! * Review of our playbook scratchpad - how we design the initial playbooks. * Automating incident response - some thoughts. This playbook webinar is taken from our certified Cyber Incident Planning & Response (CIPR) workshop and we will have several past attendees sharing their experience about the workshop and how they implemented the lessons from this training. Morrisons, the fifth largest super market in UK, will go down in history for all the wrong reasons. The inability to not just prevent but detect a massive data leak has meant that its brand name is being dragged through the mud and dirt, not once, but many times over. Yes Morrisons could have done many things and this webinar is NOT about beating up the brand or pointing a finger. Experts in this webinar will discuss a better, simpler approach that may reduce or at least make these kind of incidents very difficult to materialise. Join Amar Singh, Barnaby Davies and Jeremy Wittkop as they take a positive and proactive approach to preventing brand-damaging data breaches. Background: The Court of Appeal (October 2018) upheld a decision of the High Court holding Morrisons vicariously liable for data breaches caused by the actions of its employee, even though the employee’s actions were specifically intended to harm Morrisons. Do Google: search for morrisons data leak court case for more information. File storage & sharing should not just be about the size but also privacy and most importantly about maximum security. * Is your data protected by default? * Who has access to your data? * Who can index your data? * Where is your data stored? These and many more questions will ensure you select the right type of service that offers NOT only you but your clients the assurance that you take privacy and security seriously - especially when it comes to the cloud. - How to design an intercept-proof file sync & sharing service? - What does End-To-End encryption service actually mean? - How to combine on premise equivalent security with consumer grade simplicity? - Where is your data actually stored and what would happen in case of a breach of those cloud servers? - What does ZERO-Knowledge mean in the real world? Cyber attacks on businesses, organizations and critical infrastructure becoming the norm in 2018. Massive breaches are constantly in the news and consumers are demanding stricter data and privacy protections. Cybersecurity has never been more important to organizations, and the investment in security technology has never been greater. CISOs are in the spotlight, and are looking to build the best strategy to secure their organizations, customers and users. - The different tools that can be used to launch such an attack. Needless to say, we will share mitigating strategies and the technology configurations that you should use to protect your web products. - Increase your operational efficiency and lower total cost of operations. PCI-DSS needs no introduction. The Payment Card Industry Data Security Standard applies to any organisation accepting credit card details in some way or the other. This webinar is going to share some of the latest techniques cyber criminals are using to break web applications. Join us to learn how they are doing this and what you should do to protect your organisation and compliance status. The great migration to the cloud is in full swing and almost every organisation is getting involved. Whether it be virtual infrastructure, email services or collaboration tools, the benefits of the cloud, such as better availability and lower costs are being embraced universally. In this webinar, several experts, including Anmol Anand, Amar Singh and Chris Payne will discuss their absolute security must-haves for cloud adoption. - Secure configuration management and benchmarking. - File storage and data transfer. - Alerting and incident response. - Authentication and identity management. Don't miss this exciting and informative webinar! With the explosion of cloud-based cloud ready applications, many organisations struggle with optimising application performance for cloud or hybrid environments. The culprit, in many cases, is the connectivity from the offices to the cloud. The wide area network, (WAN) connecting offices to the Internet and to other offices, is still playing catchup. WAN technology is stuck in the old-age. Think about this: Does your business, small or large, have two or more broadband connections, maybe a broadband and a dial up or some other form of Internet connectivity? Apart from the security risk of having too many Internet points of exit, your business is also wasting money and resources in managing these various connectivity channels. In this webinar, Amar Singh and Steve Vickers explore the problems typically faced by organisations based on the latest research and show how organisations can create a seamless and secure SD-WAN infrastructure without having to manage multiple products. Amar Singh, CEO and co-founder of Cyber Management Alliance, recently had the pleasure to sit down with Ashish Khanna, information security officer at Dubai Health Authority, to briefly talk about what led Khanna to Dubai and to discuss some of the life lessons he learned along the way. We do two things in this webinar - review how the UK-GCHQ Certified Training course, Cyber Incident Planning & Response or CIPR has helped organisations like the NHS and BMJ and discuss how you too can create actionable playbooks. - The flow and logic behind creating playbooks that work. We also discuss management playbooks along with technical content and share insights into how you can automate your playbooks. CREST president Ian Glover sat down with Amar Singh, CEO and co-founder of Cyber Management Alliance, to talk about his career and pass on some of the insights he has gained over the course of his long and fruitful career in information technology. In today’s privacy oriented and highly regulated world, it can be tough being a compliance officer or an IT security manager. Balancing mandated requirements with a finite budget and limited resources may come to define these very roles. In this webinar, Amar Singh, Global CISO and CEO of Cyber Management Alliance; and Chris Payne, Managing Director at Advanced Cyber Solutions, will discuss how to get efficient when it comes to regulatory requirements and standards. By finding the commonalities between NIS, NIST, ISO 27001, GDPR and PCI-DSS, you can implement controls and solutions which kill multiple birds with one stone. Amar Singh, CEO and co-founder of Cyber Management Alliance, had the pleasure of interviewing Sanjay Khanna, CIO at Rakbank in Dubai, as part of their informative Interview with Cyber Leaders series. Amar talked to Sanjay about a variety of topics, asking key questions about interview criteria, why it’s important to be prepared to take risks and step outside your comfort zone, and what excites him about the next 5 years. “If you are not hardening your systems you deserve to be breached” Amar Singh. It’s a chore but operating systems have to be hardened, secured and configured correctly to ensure they are not the “lowest hanging fruit” in the organisation. Furthermore, you can’t just harden your system once, you must continuously monitor and baseline it against common standards. The CIS or Centre for Internet Security is a leading non-profit organisation that provides a wide array of baseline guides for securing various systems. Dhiraj Sasikaran, the former Director of information security at Dubai Holdings, which Jumairah Group is also a part of, sat down with Amar Singh in Dubai. Dhiraj talked about his formative years, the importance of training and passion, knowledge and training for CISOs and why it’s not just about technical skills in the ever-challenging cybersecurity sector. Running a security operations is not a simple undertaking. It takes skilled staff, technology, processes and procedures and loads of practice. In addition, actionable contextual threat intelligence is key when it comes to ensuring the SoC and its teams are affective in early detection of attacks. The key word here is EARLY detection. Join Amar Singh and his special panelists as they discuss some of the key pillars of threat intelligence and how to make them work in any SoC environment. Industry giants take their dominant position for granted and often ignore client requests for improvement and innovation. Given that the FIM or file integrity monitoring industry has seen little innovation over the last decade, Chris Payne and Amar Singh sit down to explore alternatives. - The current FIM landscape, its importance and relevance. - The challenges that organisations are facing in the operational life-cycle. - Why household names are exploring alternative FIM options. - How you can see an instant reduction in operational costs by up to 70%. Ok, email is boring. Email is antiquated. Email is NOT dead, particularly with GDPR now in everyone's minds it remains the favourite attack vector for cyber criminals! Like it or not, if you don’t show the deserved love and attention to email, criminals will keep winning. No, User Education is not THE only answer. You need the right set of technologies that enable organisation to be cyber resilient. Join Amar Singh, practicing CISO, as he presents 'The 5th Floor - Why Protecting Email Remains the Most Sensible Strategy' and discusses with Peter, Stefan and Junior the lessons learnt and technologies available to businesses to increase their cybersecurity maturity. Cyber Management Alliance presents an exciting series of interviews with International Cyber Security Leaders. Want to know what they look for when hiring for their teams? Want to know the secrets to their success and what keeps them awake at night? Theses exclusive interviews are presented by industry thought leader and Chair of ISACA's UK Security Advisory Group and Global CISO Amar Singh. Series but humours and light hearted interviews. See the leading figures in Cyber Security like you've never seen them before. From Eugene Kaspersky to CTO HP Enterprise and CTO of Intel Security we have an amazing line up. Subscribe for updates. Title: Most 2FA Solutions are Insecure, Is Yours One of them?